October's a great month for spooky storytelling! I love so many stories, but a favorite author, Lafcadio Hearn, deserves featuring and he's definitely in the Public Domain. I'll end this with his best-known and loved "The Boy Who Drew Cats", but want to give more about Hearn first. This site offers a quick introduction, an interesting Bulletin Board related to his work, and some other resources. Wikipedia gives the usual thorough, but dry article, yet it gives a good sense of why Hearn's bleak unusual life changed so thoroughly at age 40 when he moved to Japan. ""Lafcadio Hearn is almost as Japanese as haiku" as the Tuttle publisher's foreword to his works aptly described him. 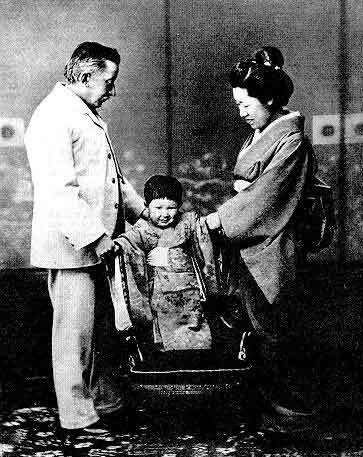 It's also why Hearn's stories are an excellent glimpse of the Meiji period when Japan was leaving its feudal roots. His Japanese marriage to a woman from a Samurai family, their own family, naturalization as a Japanese citizen taking the name of Koizumi Yakumo, and teaching, including at the university level, all show a man who finally found where he belonged. I also went to BrainyQuote for a look at what others felt he said of significance. His work as a professor of English Literature at Tokyo Imperial University and Waseda University is shown instead of his retelling the Japanese tales I love. It's interesting, however, because much is made of his moving from Catholic roots to Buddhism and yet his respect for the Bible as literature is repeatedly quoted. As an indexer, I love his "One of the great defects of English books printed in the last century is the want of an index." 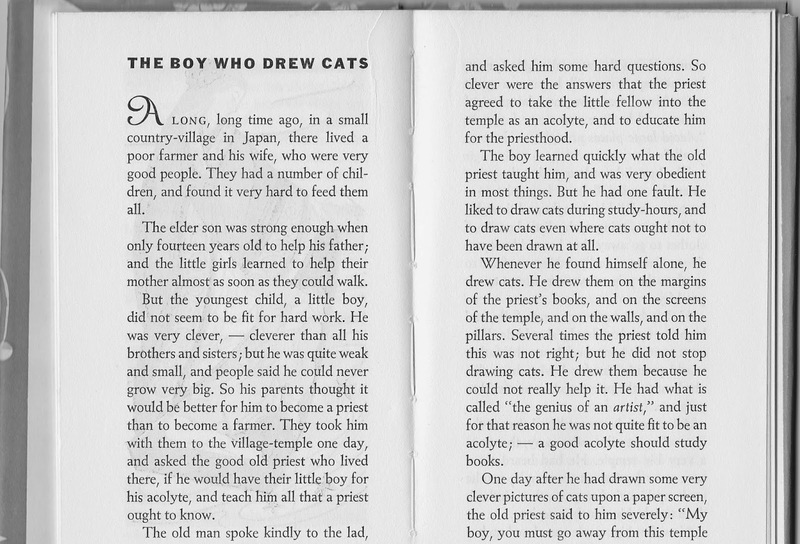 Now for my brief introduction to "The Boy Who Drew Cats." Originally he titled it "The Artist of Cats", it was from a Japanese tale called "The Picture-Cats and the Rat", but Hearn gave his own spooky touches and a different ending from the traditional one of the boy going back to become the abbot of his temple. Japanese Fairy Tales not only contained this story, but is one of many books Hearn produced. 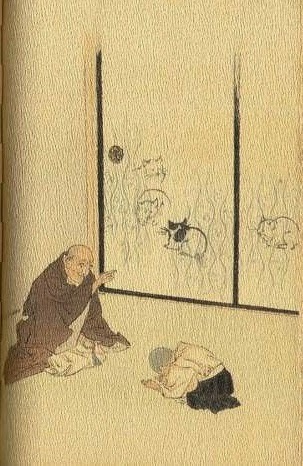 That book opens with four stories by him, but includes many other traditional Japanese stories such as "My Lord Bag-o'-Rice", "Tongue-Cut Sparrow", "Urashima", "Momotaro" and more. 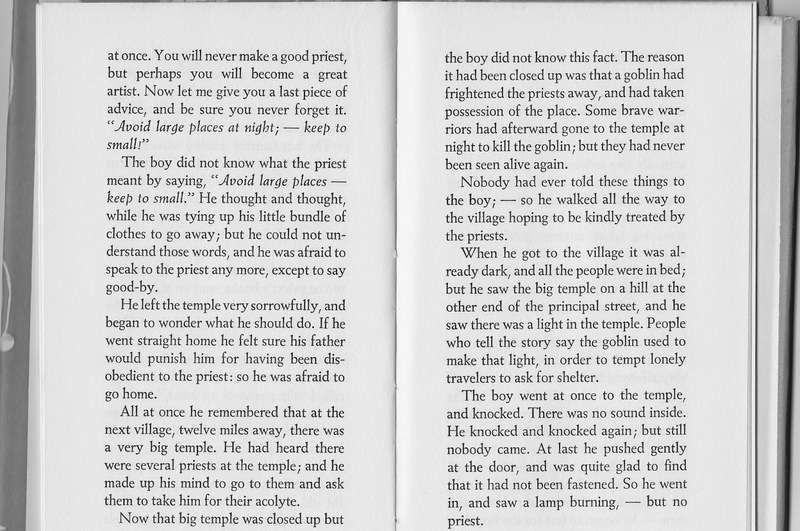 Hearn's stories include "The Goblin Spider" which is spooky, too, and I love his cautionary "Chin-Chin Kobakama", but do NOT recommend it at bedtime to children.